Home / airlines / news / Airlineblog Survey-No takers for expensive in-flight WiFi in India! Airlineblog Survey-No takers for expensive in-flight WiFi in India! So far, in-flight WiFi was available to Indian domestic passengers. Though the technology was available and various airlines around the world do offer this, it was restricted over Indian airspace, due to security fears. Recently TRA(Telecon Regulatory Authority of India) has lifted this ban and is encouraging airlines to provide in-flight internet connectivity. You can read related news here and here . In order to comply, airlines will have to install necessary digital equipment on-board their aircrafts, tie up with service providers and set up mechanisms for passengers to connect and pay. There will also be some tracking requirements for security purposes. All these will cost money. In India, longest domestic flight is about 3 hours (From Trivandrum to Delhi). Other flights will be much shorter. I doubt if WiFi will be available throughout- from entry till exit. Mostly it will be switched on after reaching cruising altitude and will be switched off when descent begins for landing. That is effectively about 2+ hours on TRV-DEL, probably just about 1 hour on routes like Mumbai-Delhi. 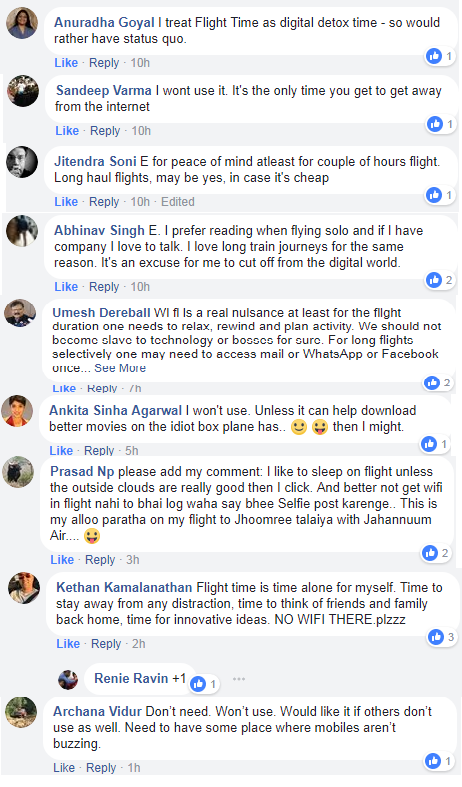 It is very critical for Indians to have connectivity while flying? Are they willing to pay a premium for this in-flight internet service? I asked my facebook and twitter friends and many of them responded enthusiastically. Below is the finding. Of course my sampling is not a huge number- about 100 responses in total- this is what I could elicit from my network of friends, but I believe it fairly represents the sentiments of Indian flyers- people who responded included those at CXO level, frequent flyers, budget travelers and occasional flyers, hence the response can be considered true for a larger Indian flying community. Only 1 person said he is willing to pay a premium- a facebook user by the name ASP Writes. Dear airlines- you know whom to target if you're trying to sell your WiFi services for a premium. I was thinking more n more businessmen who may be ready to pay this premium so that they can stay updated on the go or send latest PPT/Excel they worked in flight to their boss etc. But this thought stands proven wrong. Most executives would prefer to take some rest during their flight. Having a connectivity means their boss would expect them to be available online during the flight, may be attend client calls, deal with escalations and all other very problems that causes stress. With connectivity executives can't sleep, can't watch a movie. Business activities can certainly wait an hour or two, so I am sure most executives won't be keen on this in-flight connectivity that takes away their freedom and personal time. 14% felt the need for internet only on long haul flights, not short duration domestic flights. This is understandable- on a 7-8 hours flight a connection will help you update your family, check latest news or prepare for your day at the destination. This means no need for internet on domestic routes for these people. Many international airlines do offer in flight internet at present. 17% said internet onboard is a nice to have feature. They would consider using it if it is affordably priced. What is affordable/reasonable is again debatable. On ground, 1 GB airtel data with 28 days validity is available for about Rs 200. On air can airlines offer say 100 MB/1 hour internet for Rs 100? That level of pricing is probably considered affordable,but if airlines plan to charge Rs 500/1000 then it is clearly on the expensive side. 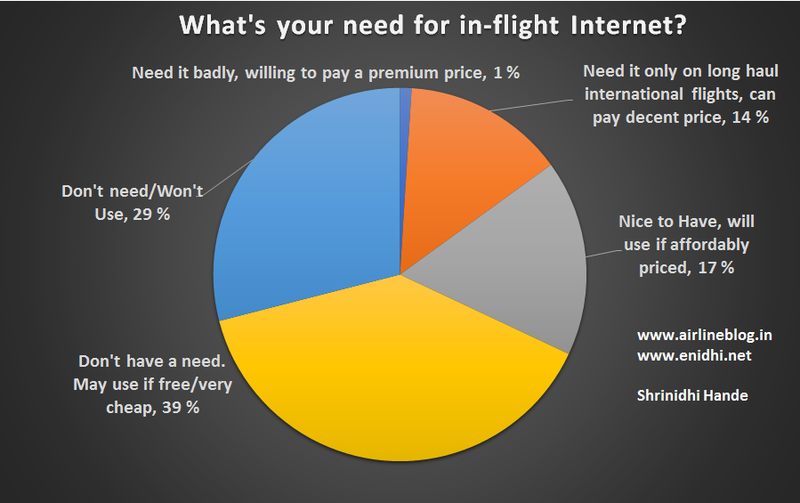 39% said they don't have a need for internet in-flight, but may use if it is free or super cheap. This forms the majority segment. If it is free or extremely cheap they are open to use it, but I am sure most airlines won't be willing to do charity and offer free internet. Will the airlines adopt a strategy of offering it for free in the beginning, get people hooked and then start charging a fee? I don't know. Let us see. Their concern is also valid- imagine what would happen if 100s of mobiles keep beeping every few seconds due to some whatsapp forward or other notifications, or every 3rd person getting on a call and speaking loud to the irritation of all other passengers around him/her. More than two thirds of Indian travelers (around 82% of people who responded) don't feel any need for WiFi on-board domestic flight. Rest consider it nice to have. % of travelers willing to pay a premium is near zero. How much international airlines charge for WiFi? What do you think on this, do comment below.